Cuphead has sold over three million copies less than a year after launch. Developer Studio MDHR announced that the 1930s run-and-gun had gone triple platinum in a blog post this week. 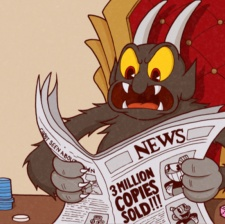 “We’re barely past the halfway mark of 2018, and are humbled to announce that Cuphead has already reached over three million copies sold,” said Studio MDHR’s Ryan Moldenhauer. To commemorate the milestone, Cuphead will go on sale for the next few days on Steam and Xbox.